Big beverage is going to be all over this one. This week the British Medical Journal published what the press is referring to as disappointing results for a school-based childhood obesity intervention. The intervention, commonly referred to as the, "Ditch the Fizz" campaign involved giving 7-11 years olds 4 one hour sessions encouraging them not to drink carbonated beverages. In the original study, the intervention reduced carbonated beverage consumption in the intervention group by 0.6 glasses per day and that group after one year showed only a 0.1% increase in obesity while a control group showed a 7.5% increase. Well guess what, three years later and all the differences are gone between the groups. Now for these results to be disappointing, I would argue they'd have to be surprising. So basically there was a public health intervention encouraging kids not to drink soda pop. That's it. 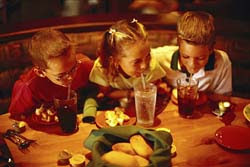 No talk of calorie awareness, restaurant calorie contribution, juice equivalency to soda in terms of calories, no teaching of hunger prevention skills and somehow there was an expectation that asking kids who are 7 to drink less soda pop would translate into a sustained long-term weight reducing outcome? Even if you want to accept the researchers null hypothesis that a decrease in soda consumption is in and of itself sufficient to change childhood obesity rates longterm, I have to wonder, do the researchers have kids? Do they know the attention and retention span of 7-11 year olds? 3 years later and they're expecting their 4 hour intervention to ask kids to drink less soda, soda that the kids might well describe as "awesome", soda that's promoted to the kids in commercials starring some of their most beloved sports and entertainment icons, to have had a lasting impact on those children's soda consumptions? Good thing for the researchers I wasn't reviewing their grant application. You can bet Big Beverage is going to run with this one.